The most interesting medieval castles of Latvia would be very interesting for tourist from any country. 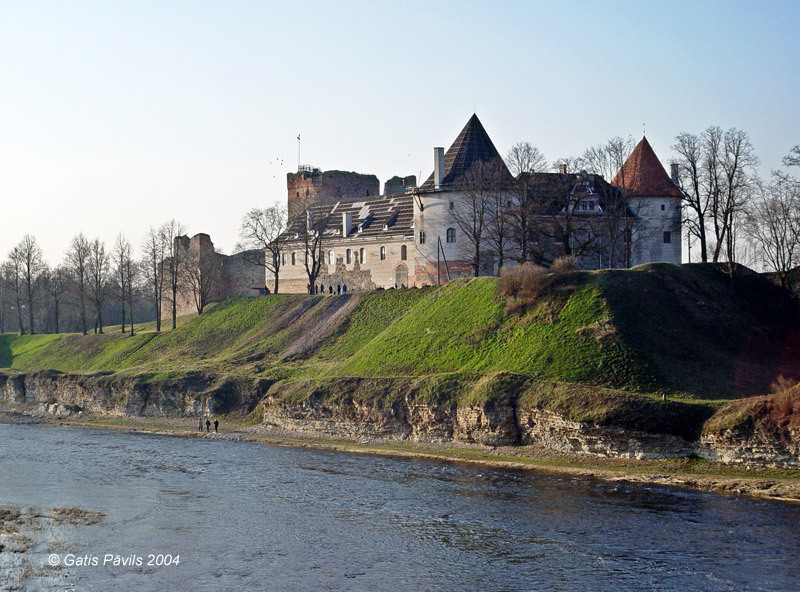 Not all of them are enormous and not all have been used to make global decisions - may be only Cesis, Koknese and Riga castles would be recognised as fairly large castles on a global scale and none of them has got global historical importance. 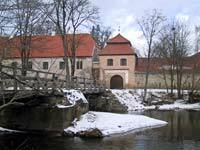 But, for example, the smaller castles in Dundaga or Jaunpils are very interesting due to their preserved medieval aura and legends. There is enormous difference between a shallow, superficial ghost-story of TV serial and a story of a real medieval castle about former and on-going events. Destinies of numerous inhabitants throughout centuries have turned the castles into real Monuments of History. Author is well aware thay he follows in steps of entertainment journals through subjective choice of 12 "most interesting" castles among 138-140 medieval castles in Latvia. If somebody would like to dispute author by proposing to include in this list Ludza castle or Sigulda castle, author would easily agree to this - the term "interesting" is very subjective. 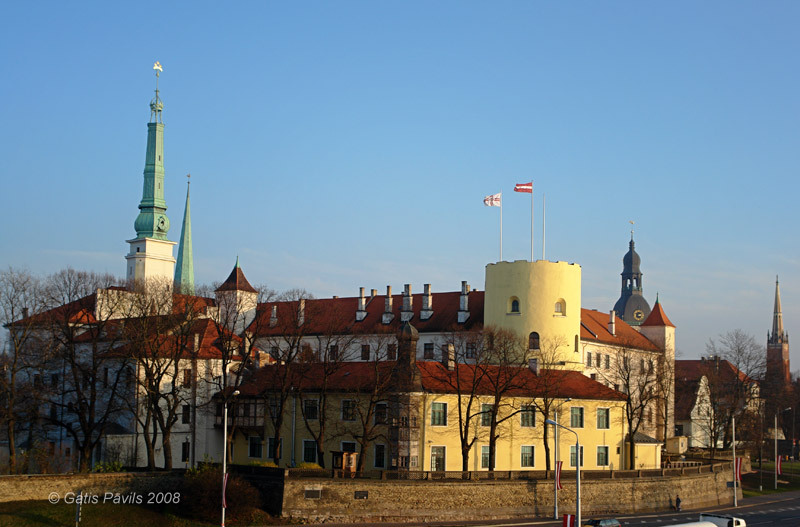 The location of Lubana castle is unknown up to this day - due to this this castle would be a lot more interesting for many than Riga III Order castle, which is seen in nearly every evening news. Ikskile Castle of Bishop is the oldest stone masonry building in Eastern Baltic (1187), but Salaspils Order castle has got 6,5 m thick walls. Now this is interesting! So - why have been choosen exactly those 12 castles listed below? 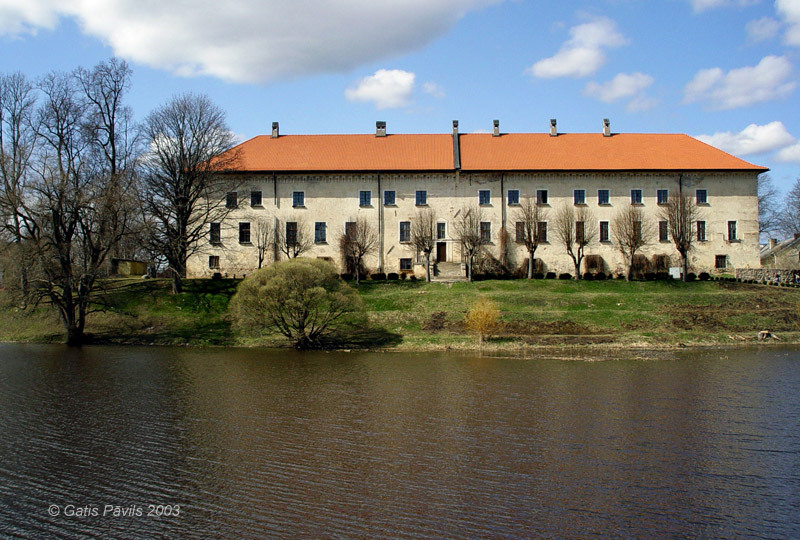 Bauska castle consists of two parts - medieval castle (built in 1443) and ducal palace (1596) - rare example of Renaissance palace in Latvia. The 124 metres long and up to 43 metres wide castle is located in picturesque junction of two rivers, it has got also an imposing system of earthen ramparts. In the medieval part there is located also a 22 metres high tower with wonderful sights from its top. Ducal palace partly preserved a sgrafito style plastering unique for Latvia - it has been renewed now. The special charm of Northern Curonia is shaped also by legendary Dundaga castle - medieval castle built by Riga Archbishopric. 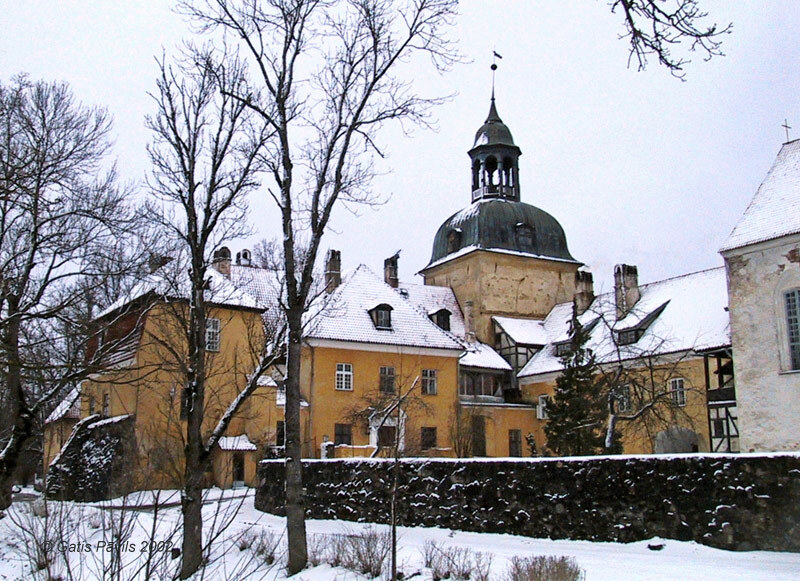 Later it belonged also to Livonian order, Courland Bishopric, Osten-Saken family and others. The 48x69 metres large castle consists of four blocks enclosing inner yard. As times went by the castle experienced significant changes, it has suffered also in warfare. During the last centuries it has suffered in fires. In spite of this Dundaga castle has survived up to this day and it has accumulated peculiar, weighty aura of olden times. Most likely Edole castle was built at the first third of the 14th century by Courland Bishopric. In spite of numerous changes the castle has preserved ancient, weighty aura complemented with numerous legends. Edole castle is the only castle of Courland Bishopric which is still in use today. Medieval part of the castle is 31,5x34,5 metres large, four blocks of the castle enclose inner yard. During the rebuildings of 18th - 19th centuries there has been created one more - household inner yard. Livonian order most likely built Jaunpils castle in the other half of 14th century to defend southern borders. 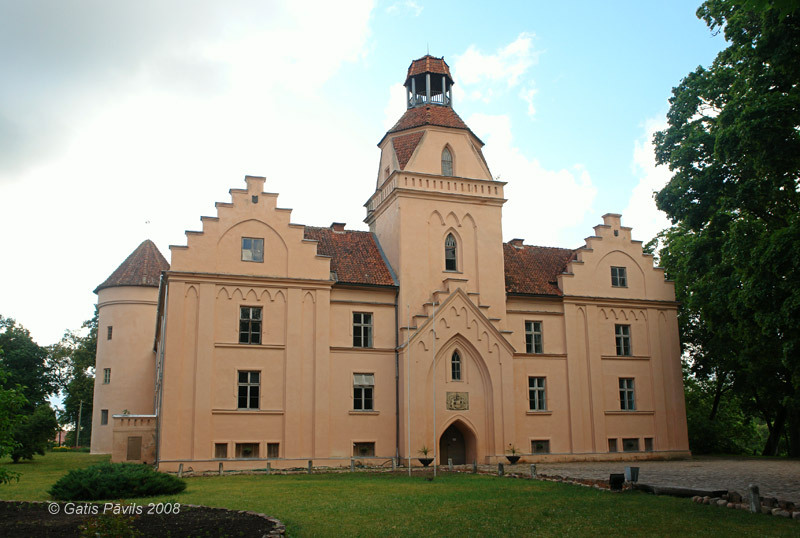 Castle has been rebuilt in medieval times, in 17th century and at most in 20th century. In spite of this numerous medieval details and outer looks have been preserved up to this day. 40,5x29,6 metres large castle consists of four blocks enclosing an inner yard. In the southern corner there stands rounded tower built in 15th century. One of the most important and picturesque medieval castles in the area of Latvia was Koknese castle which was built shortly after 1209 in 30 metres high, wedge-shaped hill between Perse and Daugava rivers over a hillfort of Latgallians. 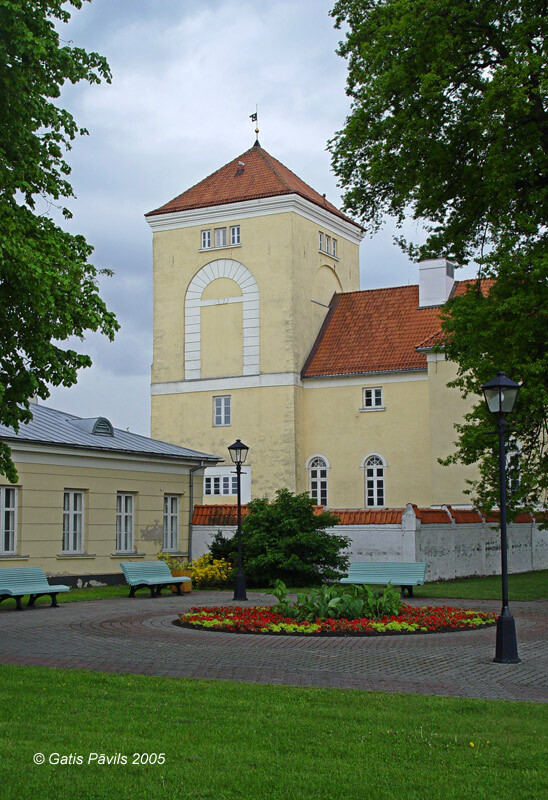 The enormous building with five towers and forepart was built for Riga Archbishopric, along its defensive wall developed fortified town. Koknese castle was abandoned in 1701 and nowadays here are impressive ruins. 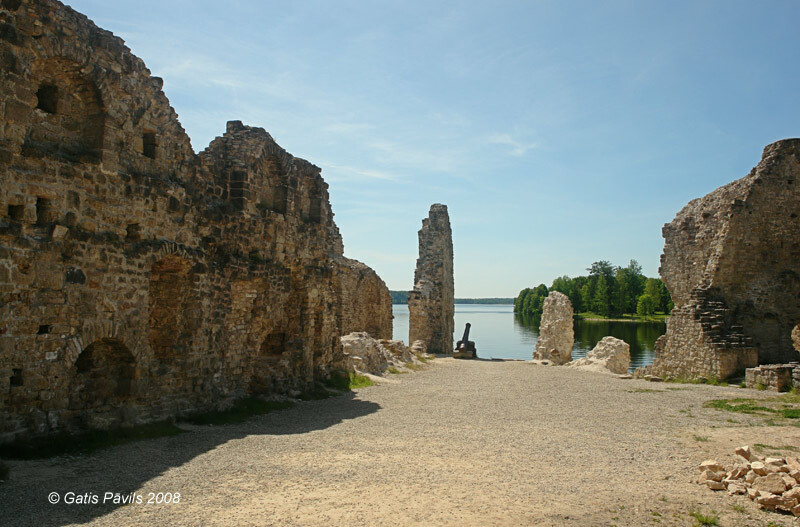 After the creation of Plavinas hydropowerplant lake the water reached the fundament of Koknese castle - thus ruins are endangered now and are fixed with concrete constructions below the water level. Krustpils castle is one of the best preserved medieval castles in Latvia - for most part of 20th century it was under the authority of different armies and thus escaped rebuilding and extensive repairs, thus reaching a status of ruins but also preserving the heritage of former centuries. 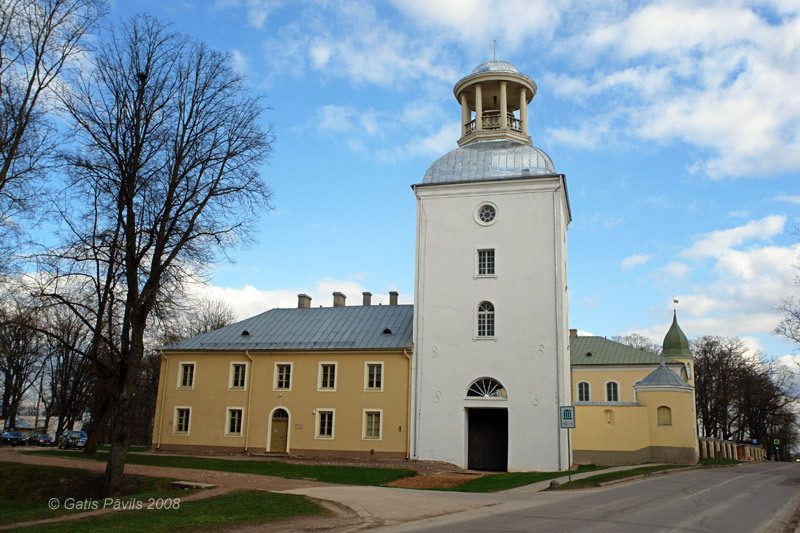 If the castle together with 29 household buildings and surrounding landscape will be renewed, Latvia would gain one of its most impressive and interesting complexes of architecture. 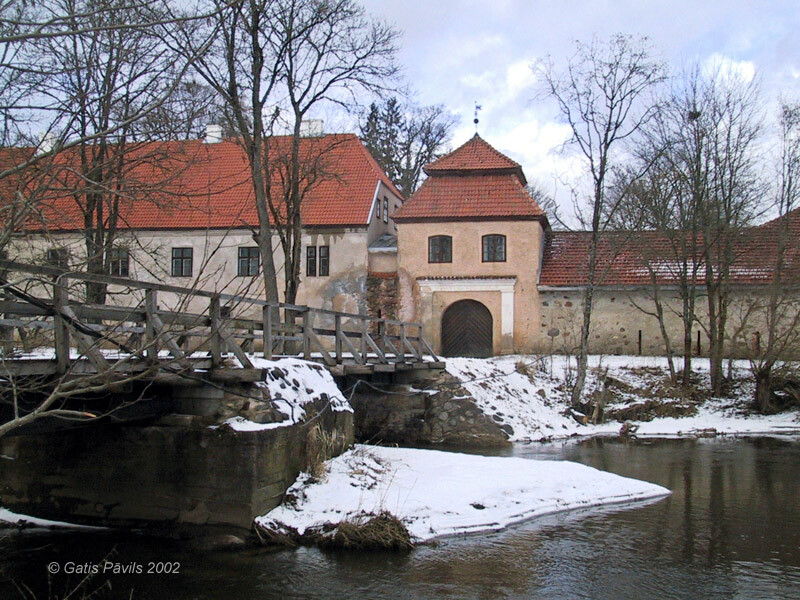 Rosens - then vassals of Riga Archbishopric - most likely have built Lielstraupe castle at the end of 13th century. Already in the end of 14th century there developed also the lively Straupe town around the castle - it perished in 17th century. Castle itself together with a complex of other valuable monuments has survived up to this day and belongs to buildings with the longest history of nearly uninterrupted use. Castle is unique for Latvia with it's well preserved medieval chapel. Novadays this is Straupe medieval church - it still forms a part of castle and the destiny of both buildings has been closely associated. One of the dominants of Old Riga is also one of the largest medieval castles in Latvia - Riga Order castle built in the end of 1340ies and then again somewhere around year 1515. This is not the only Order castle in Riga and by far not the only medieval castle in Riga - but it's history is the longest and most interesting one because this building has served as a centre of power for larger or smaller area. Nowadays it is also a residence of Latvian President. Castle has been rebuilt numerous times thus loosing numerous values of art and architecture and getting other ones instead. Special value of the castle is also values of art from 1920ies - 1930ies. 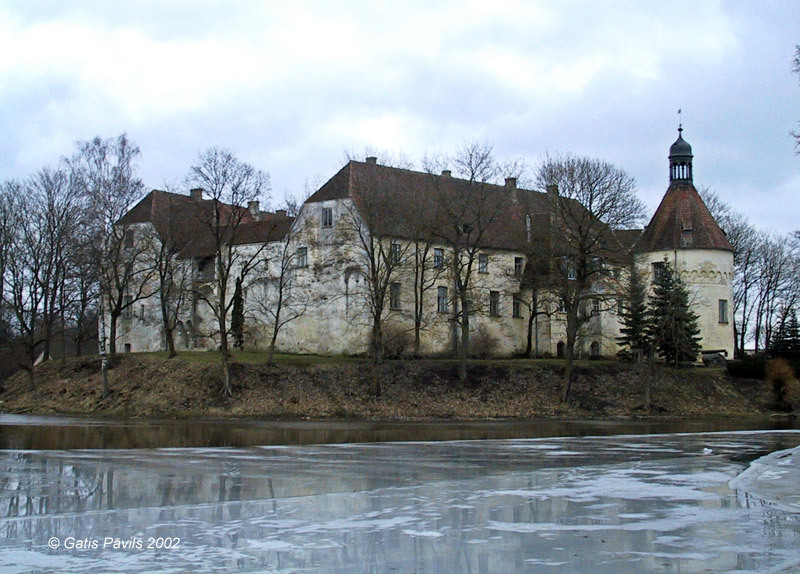 The sole survived fortified centre of manor from 16th - 17th century in Latvia is Slokenbeka castle. 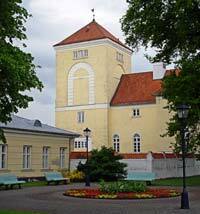 This castle of Livonian Order is first mentioned in documents in 1544. Nowadays there has been preserved the impressive defensive wall which encloses large quandrangular area with several buildings - mainly from 19th century - along its inner side. Interesting elements of Slokenbeka castle are both gatehouses with towers built in 1688 an 31 portholes in defensive wall. 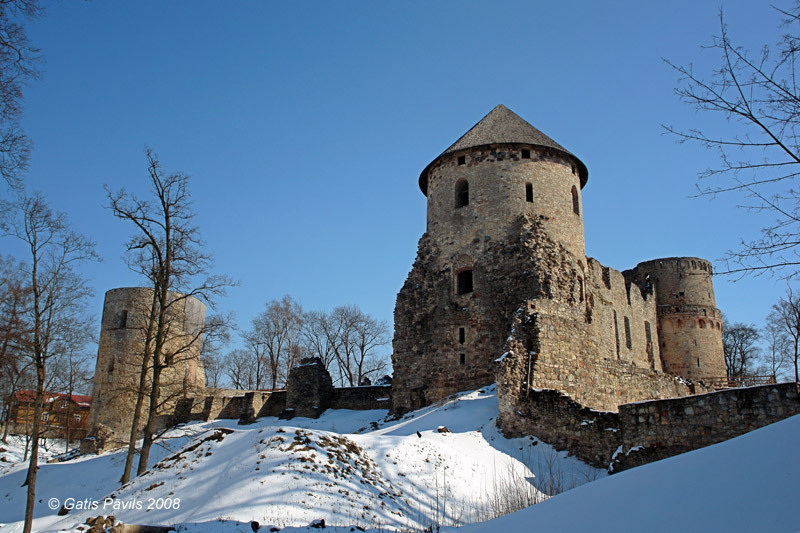 One of the oldest visible castles in Latvia is Turaida castle - it is built in 1214. Few buildings in Latvia are located in such a splendid landscape - castle is set on some 80 metres high strip of land between two ravines at Gauja River. 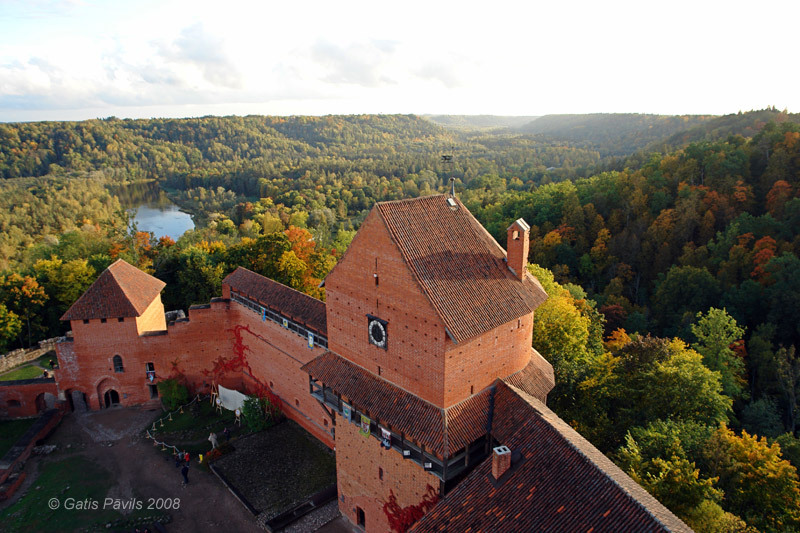 There is marvellous view from its 27 metres high tower over the forested Gauja valley. Castle has been built for Riga Bishop/Archbishop and has experienced more warfare than most other medieval castles in Latvia. It is not inhabited since 1776 and gradually was turning into ruins - until in the second half of 20th century there was started rebuilding of the castle for boosting of the tourism and rising the knowledge level. Among the few Latvian medieval castles guarding the access to trade routes from the sea the only one which has survived is Ventspils castle. It has been constructed by Livonian order - most likely in the end of 13th century. Castle consists of massive tower and four blocks enclosing inner yard. At the same time the tower of the castle can be considered to be the oldest lighthouse in Courland. Over the last decades the castle underwent impressive rebirth and simultaneously - significant changes including modern elements (f.e. glass roofing over the inner yard) and has been shaped as one of the most attractive museums in Latvia.